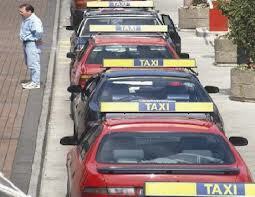 Believe me, if you stay in Ireland for any period of time, you will grow to hate Dublin Taxis. To begin with there is simply no consistent method of determining whether an approaching or passing cab is free for hire. True they have oblong, rather tatty illuminated signs lashed to their roofs, but most such signs don’t seem to work. And when they do it is immensely puzzling. You will almost certainly fail to ever properly work out whether the sign illuminated means they are free or means they are occupied. You will find yourself, time after time, signalling an illuminated cab you think is free only to see it cruise past full of passengers, or perhaps not signalling a cab because you think it already hired only to see it cruise past into the Celtic mists, completely empty, leaving you looking and feeling a right prat. And they seem completely unregulated. Most European cities, indeed most European towns impose a regular uniformity on the type, colour and standard of vehicles allowed to ply for hire. Not so in Dublin. Converted vans, jeeps, cars of all different sorts and sizes, no standard colour no standard passenger specifications. There are some cars so old that they wouldn’t be allowed on the road in most countries. And some so small that if you are carrying a briefcase you will have difficulty getting in. And it has to be said that a lot of them are not kept particularly well. Cleaning standards are not universally high; and loud music is ubiquitous. Oh what joy to fly across to London with its black cabs…. And the buses. The feckin buses! Dublin is the only major or capital city bus service, in the whole of developed Europe, no, no, in the whole feckin world, that refuses to open or close the central bus doors. Everyone must get on the bus, alight onto the bus, embuss on the bus, through the front doors only. And everyone on the bus, must exit the bus, debus from the bus, get off the bus through the same front doors that those alighting on to the bus are trying to embuss. Result – chaos, extra time, extra hassle, bemused debussing tourists clashing with equally bemused embussing tourists. Even more bemused tourists, still embussed on the bus, frantically pressing the deactivated centre door exit buttons, discovering in alarm that they don’t work and then rushing the front door, battling through the incoming embussers to get off the bloody vehicle. Why don’t the Irish just use the central feckin doors? Apparently it goes back to some ancient unresolved industrial dispute between the bus drivers union and Dublin City Hall. Quite possibly, judging by the state of Irish Industrial Relations, as far back as to the time of horse drawn omnibuses and James Larkin. The dispute, we are told, is still going through union procedures! Don’t hold yer feckin breath!